A professional supplement increasing fat-free muscle mass. Its base is a complex of advanced, complex carbohydrates, based on long-chain maltodextrins and excellent macromolecular waxy maize starch - Waxy Maize, with a low glycemic indices. The carbohydrate base has been additionally complemented by an advanced formula containing protein matrix of perfectly assimilated concentrate, isolate and hydrolyzate of whey protein combined with a slowly absorbed, exclusive micellar casein. An ideal ratio of full-value proteins and complex carbohydrates for optimal growth of lean body mass has been enriched with isomaltulose, MCT oil, L-glutamine, taurine and a complex of the most essential vitamins. 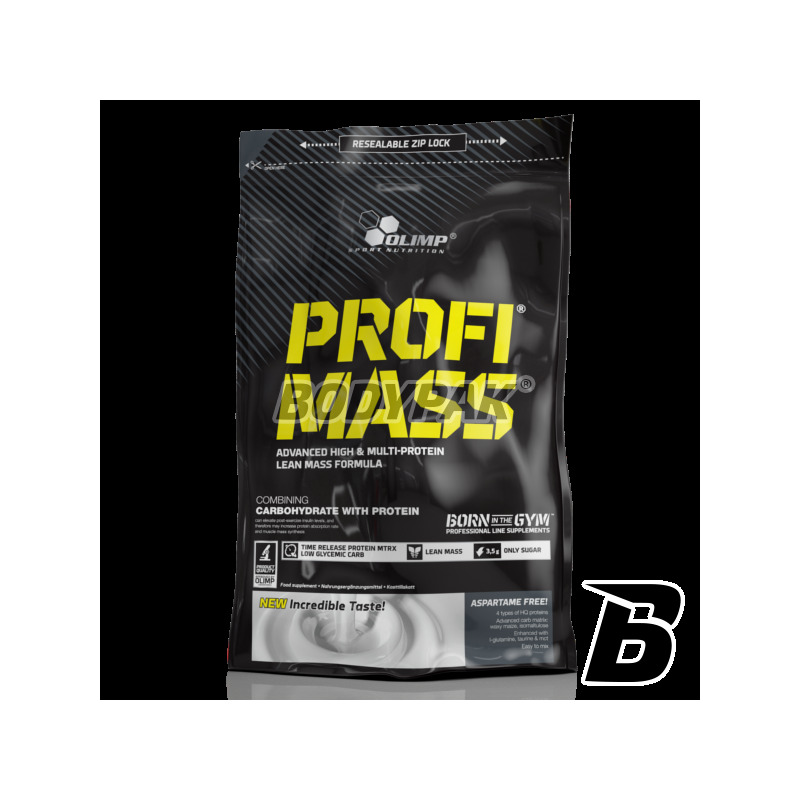 Profi Mass composition ensures mutual synergy of action of its individual components, in order to achieve maximum anabolic effect with minimal body fat. Profi Mass will ensure maximum gain lean muscle mass! Profi Mass contains the most advanced supplementary protein matrix combining all fractions of milk protein (hydrolyzate, concentrate and whey protein isolate, as well as flawless quality micellar casein) the value of the BV of up to 159. 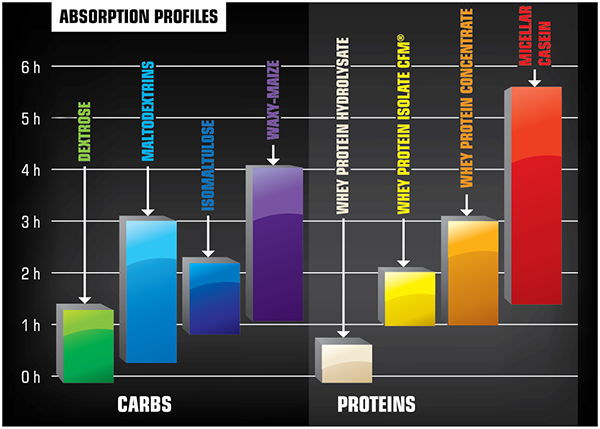 The proportions of protein sources used were chosen on the basis of precisely determined kinetic rate of digestion and release of amino acids into the bloodstream, and the efficiency of their absorption into cells and integration into the own body. This extremely efficient protein blend ensures the highest blood saturation with protein digestion products within 15 minutes from the time of its administration (whey protein hydrolyzate), reaching a maximum concentration during 45min- 2 hours. (Whey protein concentrate, whey protein isolate) and still maintaining a high level for a subsequent 6 hours (micellar casein). 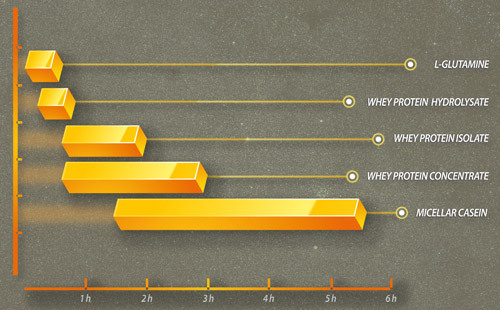 Carefully selected quantities and types of protein sources provide the most desired for muscle regeneration, amino acid profile, especially rich in essential amino acids and branched. Taking Profi Mass guarantees, thus maintaining the highest anti-catabolic effect, both during intense physical effort and just after it, directly contributing to overcompensation nutrients. In such favorable physiological conditions of post-training regeneration it will occur at peak performance. Whey protein isolate and micellar casein will additionally reveal their high potential in the lipolysis process intensification, changing the habit sportsman's body, making it more degreased. 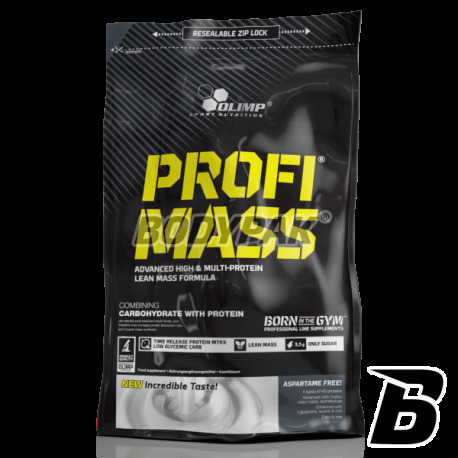 The essence of the effectiveness Profi Mass', besides carefully selected protein fractions, results also from innovative formula of Low-GLC ™ based only on carbohydrates with a low glycemic index (poly- and oligosaccharides, long-chain waxy maize starch Waxy Maize, isomaltulose). The concept of the applied carbohydrate complex is based on the assumption of a moderate and stable in terms of anabolic insulin levels in the blood. This excludes fluctuation of sugar level in the serum and guarantees an uninterrupted absorption of energetic ingredients in the muscle cells. This ensures, along with the simultaneous supply of amino acids, a permanent anabolic condition in the body and very effective replenishment of inventories muscle and liver glycogen. Moderate level of monosaccharides in the blood, obtained after ingestion Profi Mass protects the athlete against a reduction in insulin receptor sensitivity to the hormone, which may be the case where the supply of large amounts of glucose. Carbohydrates from the Profi Mass are a continuous source of energy immediately after its intake (fructose) and maintain a stable supply of carbohydrates after 30 minutes (maltodextrin), up almost 4 hours (long-chain waxy maize starch Waxy Maize and isomaltulose). This provides immediate availability of energy components from the first moment after training. The addition of MCT oil additionally enhances regeneration processes so that in turn follows the growth and adaptation of load training and muscle tissue could be carried out without any obstacles. The efficiency of the metabolic condition of vitamin! A complex of as many as 12 vitamins added to Profi Mass safeguard the effectiveness of all enzymes involved in the metabolic changes in the regeneration and growth of muscle tissue. Vitamins and minerals absolutely must be completed, since their loss during intense effort is great and significantly reducing the quality of all biochemical processes in the body of the athlete. You can not let that happen! Supplying selected vitamins from Profi Mass guarantees intensification of the anabolic effect resulting from the presence in the blood of high concentration of amino acids and carbohydrates from digestion of both innovative formulas - carbohydrate and protein. Additionally, a high antioxidant potential portion of vitamins helps maintain a low level of free radicals in large quantities by the muscle cell during intensive. You can further "tweak" protein anabolism? Absolutely! The answer is Taurine. It accelerates protein metabolism and assimilation, as well, by reducing serotonin production, impedes muscle protein catabolism. It improves the absorption of carbohydrates, reducing their levels in the blood, and facilitates intramuscular creatine transport. This significantly increases the regeneration of the body so. Positive also affects the functioning of the liver, the entire nervous system and cardiovascular system. The addition of L-glutamine, operating synergistic to taurine, guarantees a maximum high anti-catabolic effect just after taking Profi Mass. Profi Mass is an excellent regenerating ingredients with perfectly selected release kinetics and, like no other "mass" in the market, it can be successfully applied just before bedtime, without the threat of body fat. It is, therefore, an ideal choice for bodybuilders and gym enthusiasts, particularly while working on the definition of musculature. Profi Mass is of inestimable help with supplemental for people having problems building high quality musculature, without, typical of a certain group of people (endomorphists), collect fat storage. Profi Mass is also a nod towards Olimp Laboratories of amateur and recreational athletes, who often do not find time to observe a balanced diet, due to the very active professional life. The ideal ally in maintaining a sporty silhouette is nourishing Profi Mass cocktail consumed at meal times. Profi Mass is also recommended for people doing endurance sports, such as. Martial arts, cycling, marathons, etc., where long, intense effort requires a constant supply of energy components. Profi Mass itself is a perfect blend of highest quality nutrients and regulating ingredients, so it does not require combining with any other product supplements or nutrients. Profi Mass composition ensures optimum absorption of sugars and amino acids to the intensely working muscle cells, which is crucial in achieving success in any sport. Ingredients: 56% protein ( whey protein concentrate (from milk), whey protein isolate (from milk), casein (milk) protein hydrolyzate of whey (milk) ), 40% formulations carbohydrate (complex poly- and oligosaccharides, long chain waxy corn starch, fructose, isomaltulose *), flavors, 0.7% MCT oil, acidity regulators - malic acid, citric acid (for all strawberry flavors); 0.5% taurine, 0.25% L-glutamine, thickeners - gum arabic, xanthan gum, sodium carboxymethyl cellulose; sweeteners - acesulfame K, sucralose, cyklaminy, 0.02% vitamins (L-ascorbic acid - vit. C, ethyl DL-alpha-tocopherol - vit. C, nicotinamide - niacin, D-biotin, retinyl acetate - vit. A, calcium D-pantothenate - pantothenic acid, pyridoxine hydrochloride - vit. B6, cholecalciferol - vit. D, folic acid - folate, thiamine mononitrate - vit. B1, riboflavin - vitamin B2, cyanocobalamin - vit. B12), emulsifier - lecithin , soybean , colors: carmine (for all flavors of strawberry, strawberry-kiwi, cherry, cherry-banana), E 150c (for all flavors of toffee, chocolate, ice coffee, coffee, cappuccino, hazelnut, tiramisu ), riboflavin, E133 (for all flavors of pistachio). * Isomaltulose is a source of glucose and fructose. Z każdym tygodniem masa pnie się w górę. Dobry produkt! Oceniam odżywkę na 5/5. Smak czekolada super oraz bardzo dobra rozpuszczalność. Bardzo dobry produkt. Stosowałem porcję 150g. wyłącznie po treningu. If you have trouble keeping your diet at a sufficiently high level and looking for a way to supplement their deficiencies - it will be a perfect choice! Refined taste will surely appeal to you! High-quality supplement for any athlete on the doorstep. High calorie gainer, which has been designed in such a way that you can enjoy a very fast increments mass and strength! Excellent addition to the diet for any athlete! Each of us is looking for a way to speed up the emergence of the effects in the form of strength and growth of lean muscle tissue. The solution to all these problems is this conditioner!